I have a HP Chromebook G4 from 2014 that won't receive official Linux (Crostini) support, so I decided to use Crouton to install Ubuntu instead. I thought some of you might be interested in this, so this article presents step by step instructions for installing Ubuntu on any Chrombook model, using Crouton. There are also a few tweaks / tips, and instructions for removing it. Crouton, or Chromium OS Universal Chroot Environment, makes it easy to install Ubuntu or Debian in a chroot environment on Chromebooks, no matter the Chromebook model or architecture. Using Crouton, you continue to use Chrome OS, but you can easily switch between Ubuntu and Chrome OS when needed. Compared to the Crostini solution for Chrome OS offered by Google, Crouton has wider device compatibility, and it enables direct hardware access. Also, compared to virtualization, Crouton has zero speed penalty since it runs natively. On the other hand, Crostini is an official project and doesn't need enabling developer mode (which is required to be able to install Ubuntu or Debian on a Chromebook using Crouton). Since your Chromebook runs in verified mode, it also means Crostini is more secure. Switching your Chromebook to developer mode is insecure! Crouton supports encryption, but as the Crouton wiki page mentions, "the encryption is only as strong as the quality of your passphrase". Backup your data. Google backs up your passwords, browser extensions and so on, but you may want to back up the files that you've saved in your Downloads folder though. You may want to create a restore image for Chrome OS by installing the Chromebook Recovery Utility extension. You'll need a 4 GB or larger USB flash drive or SD card. 1. Switch your Chromebook to developer mode. 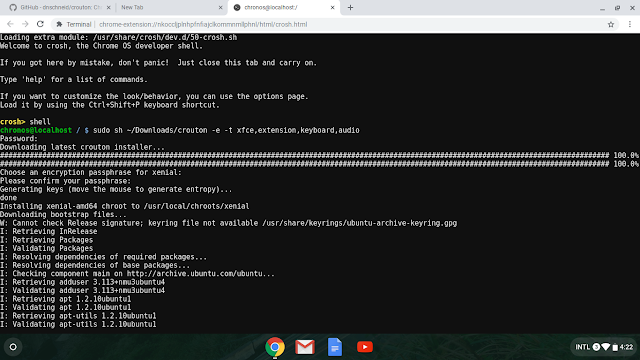 Installing Ubuntu on your Chromebook with Crouton requires switching the Chromebook to developer mode. Enabling developer mode may vary depending on the Chromebook model you're using. 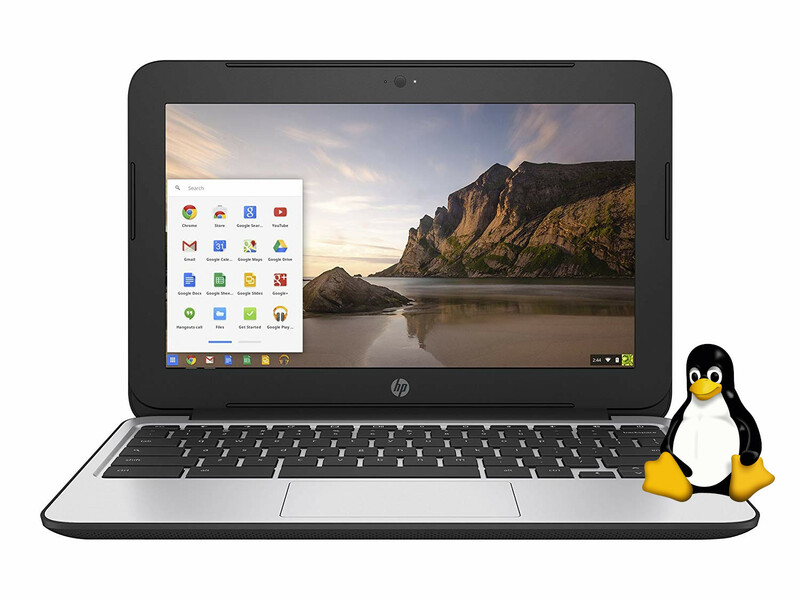 You can find out the instructions for switching your Chromebook to developer mode by visiting this page, clicking on your Chromebook model, then follow the instructions. From what I've seen, these are the instructions for most models: invoke Recovery mode by holding down the ESC and Refresh (F3) keys, and poking the Power button. After entering Recovery, press Ctrl + D (there's no information about this displayed on the screen - you have to know this to use it). It will ask you to confirm and then reboot into developer mode. From now on, each time your Chromebook boots up, you'll need to press Ctrl + D or wait 30 seconds to continue. Don't press the SPACE key as it will reset! Go to the Crouton GitHub project page and click the goo.gl link at the top of the page to download the latest version of Crouton. This is a direct link to the latest Crouton download (it may change though). Leave the downloaded file in the Downloads folder. 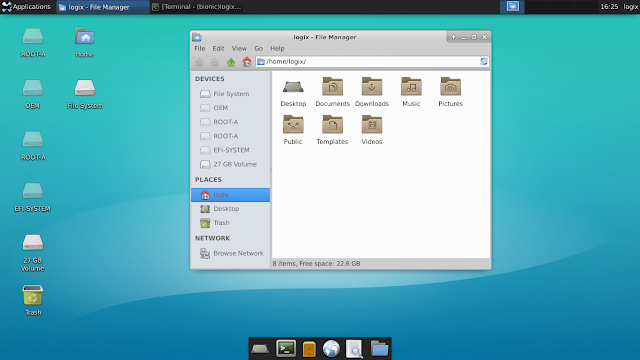 Crouton can also install e17, Gnome, KDE, LXDE, and Unity desktops. Also, you can specify multiple targets by separating them using a comma. You can also install the xiwi target to allow running Ubuntu in a Chrome OS tab or window (unaccelerated). This requires installing the Crouton Integration Chrome extension. A screenshot of this can be found at the top of the article. Some versions are not officially supported though, but they may work. This includes Ubuntu 18.04 Bionic Beaver! You'll be prompted to enter your password, encryption password, and then Ubuntu will start. The command used to start it varies with the desktop environment you've installed, and is displayed after completing the installation. So if you've installed KDE, use sudo startkde, and so on. Switch between Chrome OS and Ubuntu using Ctrl + Alt + Shift + Back and Ctrl + Alt + Shift + Forward. This way you switch between Ubuntu and Chrome OS without exiting Ubuntu. 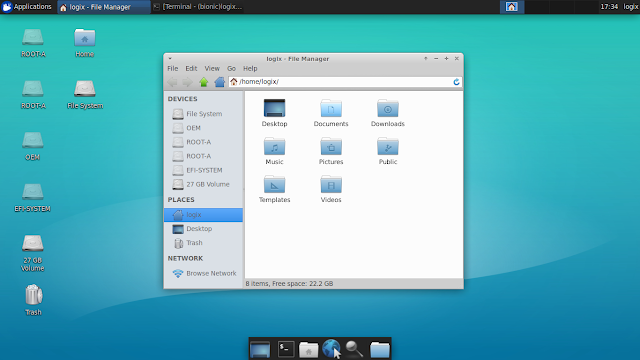 To exit Ubuntu, log out from the menu present on the top panel. If you still can't install applications using the Software app, log out (and make sure you don't enable saving your current session on the Xfce logout screen) and try again. Or try killing any background-running gnome-software instances using killall gnome-software, and try again to install some software. You will only be able to install regular (DEB) packages using Gnome Software. Installing snap packages doesn't seem to work, or at least I couldn't find a way to make it work. Installing snap packages doesn't using any installation method you may try - using Ubuntu Software or from the command line. 2. You might want to add third-party PPA repositories, which you'll find in many online guides for installing various software that's not available in Ubuntu directly. But this command does not work by default when installing Ubuntu on a Chromebook using Crouton. You may also try the other themes to see which one you like the most, or install more themes. If you want to completely remove Crouton, you can reboot your Chromebook and press SPACE while booting to turn on OS verification. This will reset the Chromebook / Chrome OS. You can also recover your original Chrome OS installation, in case you've created a backup using the Chromebook Recovery Utility.